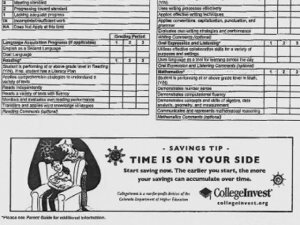 Advertorials: Does Advertising On Report Cards Go Too Far? 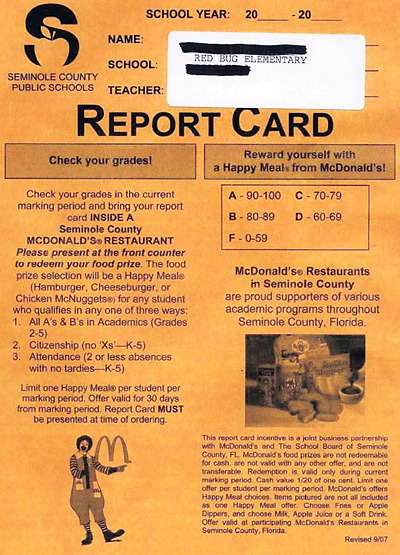 Does Advertising On Report Cards Go Too Far? Just how far is too far when it comes to advertising? 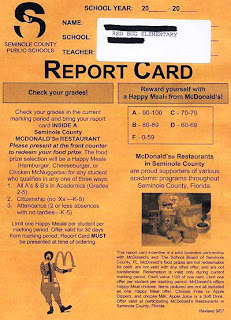 How about ads for CollegeInvest or McDonald's on your child's report card? next two years, we really do need to be creative." The CollegeInvest ad will generate $90,000 over a three-year period. In return, a 2-inch ad will be run at the bottom of all elementary school report cards three times a year. "We have similar missions. CollegeInvest is all about education. It seemed like a win-win for both of us. non-profit and it's helping families that obviously have children." While Colorado may be able to claim a loose connection to a nonprofit organization that focuses on education, other school boards have been far less concerned with making this tie, printing advertising from companies like McDonald's. In these days of shrinking budgets, school districts have had to make some rather difficult decisions about everything from the subjects they offer to the technology they buy to classroom size to staffing. If advertising on report cards allows a school to buy 10 more computers or to continue to teach French or to keep a few more teachers employed, is it necessarily a bad thing? U Rah Rah Buffalo ... Or Is That Verizon? Westin Hotels Promise "A Better You"